This summer UMBC students teamed with residents of Charlestown Retirement Community to create a series of digital stories. Drawn from the life experiences of the residents, the stories combined narration, animation, photos and music in short movies to be shared with others. Residents worked closely with student partners, acting as author and creative director of their individual story. Each student brought their own style and talents to the project, helping to create some unique examples of intergenerational storytelling. The project was organized by the New Media Studio with funding from Retirement Living TV. You may view the videos below (requires Quicktime 7). During the fall semester and winter break, students from the New Media Studio returned to the Charlestown Retirement Community for another round digital storytelling. Following the success of last summer's project, Retirement Living TV agreed to extend the workshop which they hope will form the basis of an ongoing program of viewer-submitted content for the network. This time cameras from RL-TV and the New Media Studio followed the students and residents as they collaborated in the creation of eleven new stories. The documentary footage and stories will be a part of an upcoming series on the project to be aired on RL-TV. You can view a short feature about the project here. Participants in the UMBC Charlestown digital story project had an opportunity to screen their works at the 2007 Maryland Film Festival as part of a master class sponsored by the Creative Alliance. Documentary filmmaker Aaron Matthews was on hand to lead a critique of the stories produced in last year's summer and winter workshops. Matthews, whose new film The Paper was screened at the festival, was impressed by the stories and encouraged the group to continue making films. "There is something really refreshing about hearing your voices.There are not a lot of films by older women and it was really nice to hear that. I would definitely encourage you to think of yourself as filmmakers and keep doing it. I think there is a lot of interest in hearing more stories from people from your perspective." During summer session of 2007 for the first time English Language Center offered the Seminar in New Media and Culture to level 3 (intermediate) students. The class met five days a week for 3.5 hours during the eight weeks of the summer session and was taught by Polina Vinogradova. The goal of this class was to introduce the students to a number of cultural concepts and illustrate how these concepts can be recognized and analyzed using a variety of new media genres. For example, in class, the students talked and read about the Iceberg Theory, individualistic and collectivistic cultures, cultures that use high and low context communication styles, identity, culture sock, and aspects of verbal and non-verbal communication. At the same time, the students watched a number of motion pictures, documentary films, online advertisements, and digital stories applying the cultural concepts they have learned about in the analysis of the latter. The students also worked on a number of weekly group projects one of which was a production of photographic maps in which they illustrated how the aspects of culture can be visually present and interpreted. The final project of the class was a production of individual digital stories on which the students worked during the eight weeks of class. In this process, the students chose the topics of their stories, wrote their narratives, collected photographic images, and chose the music to accompany their verbal narration. The students also discussed their stories in class, peer-reviewed their narratives, and made online journal entries twice a week which allowed them to reflect on their progress and express their doubts and concerns to their instructor. The students also intensively worked in the computer lab putting their stories together under their instructor's guidance. Several digital stories that were produced in this class can be viewed here. This summer, nine UMBC faculty members participated in a three-day digital storytelling workshop at UMBC. For the second time in two years, OIT and the New Media Studio brought experts from the Center for Digital Storytelling in Berkely to campus, giving faculty members an opportunity to learn the basics of creating digital stories while exploring possibilities for integrating new media into their teaching. Joby Taylor This I Believe: Mystery with a Capital "M"
Pat Scully Our Family is Born! For more information visit Digital Storytelling @ UMBC. A pioneering and unique Digital Storytelling Project organized by UMBC's New Media Studio and funded by Retirement Living TV (RLTV) has won a Bronze Telly Award. The prestigious Telly Award cites the Digital Storytelling Project as being among the world's best in local, regional, and cable television commercials and programs, as well as among the finest in video and film production. This year's Telly Awards received over 13,000 entries from all 50 states and 5 continents. The Digital Storytelling Project is the nation's first three-way partnership between a media company, a university and a retirement community. UMBC students team with Charlestown residents to create a series of 17 digital stories and music in short movies to be shared with others. Charlestown residents work closely with student partners, acting as author and creative director of their individual story. Each student brings their own style and talents to the project, helping to create some unique examples of intergenerational storytelling. The project is organized and supervised by UMBC's New Media Studio. Student award winners Jorge Rios, An Nguyen-Gia, Samantha Duvall, Andrew Chang, Joanna Lit, and Cathryna Brown received their statues at a ceremony held on September 12 at Charlestown. Andrea Olivier, not pictured. also received a statue. "We are honored that the television industry has recognized the hard work that went into producing these fascinating digital stories," said Brad Knight, president of RLTV. "The digital stories are reality TV at its finest. They provide a rich, intergenerational experience for Charlestown residents and UMBC students. "Winning an award like the Telly is significant in that it acknowledges that stories drawn from the life experiences of retirees with a wider audience," said Knight. "It is also gratifying that the award recognizes the entire collection of work from the Charlestown project. It is very much a group process and every story enriched the experience." In October 2008, the New Media Studio worked with members of the Somali Bantu community to create digital stories as part of the American Friends Service Commitee's "Project Voice." The production workshop was facilitated by the Center for Digital Storytelling with a final production session at UMBC's International Media Center. Baltimore's Somali Bantu's tell their stories of war, forced migration and resettlement to our city. In short digital videos, using original art, narration, and music, five young Somalis share powerful testimonies in English and their native Maay Maay, which they wrote and produced with the AFSC. Hand-drawn pictures of soldiers wielding automatic weapons and bulldozers decimating the countryside combine with moving narration, such as Mohamed Iftin whose farm was confiscated by the Somali Government. The stories were released online on Dec. 10 to commemorate the 60th anniversary of the Universal Declaration of Human Rights. You can view the stories and learn more about Project Voice here. On May 25, 26 and 27, UMBC's New Media Studio conducted a three-day introductory level digital story workshop for faculty. In addition to producing a digital story of their own, those attending the workshop gained insight into digital storytelling as a pedagogical and research tool. The workshop was facilitated by a team of faculty, staff and graduate assistants who have over the last few years have worked extensively with digital stories in a number of ways. These included Bev Bickel, Jason Loviglio, Steve Bradley, Paul Iwancio, Bill Shewbridge, Polina Vinogradova and Satarupa Joardar. One of the highlights of the workshop was a session on audio conducted by Steve Bradley of Visual Arts. Steve covered recording techniques and sound effects with a hands-on demonstration of creative techniques for building soundtracks. During the summer of 2009, UMBC’s New Media Studio teamed with the Center for History Education to offer a two-week workshop for Baltimore County K-12 teachers exploring the intersections of oral history and digital storytelling. The workshop was the culminating activity in CHE’s two-year “Making Master Teachers” program. Year One of the program focused on reading and research, while Year Two focused on incorporating primary sources in the classroom. The program was funded through the U.S. Department of Education's Teaching American History Grant Program. Teachers had an opportunity to learn classroom skills for creating their own work and developing student projects. Projects from the workshop included "Hampton: A Revolutionary Place" . Information for attendees : This summer workshop provides you with the opportunity to learn skills of digital storytelling that you will be able to use in your classrooms, both in delivering your own content and as a project option for your students' original work. In addition it will allow you to disseminate the work you did on Baltimore '68 and will provide UB with an innovative addition to its Baltimore '68 website. Since we are working under time constraints, we hope to come to the June sessions with a good idea of the form of the project, although the content can evolve over the course of the workshop. I propose that the Baltimore County high school group break into two teams and produce two digital stories about the uprising of April 1968 in Baltimore. I would suggest that each team takes a section of the UB Baltimore '68 driving tour (voted "Best Driving Tour for Visiting In-Laws" by City Paper and available at http://archives.ubalt.edu/bsr/timeline/index.html) and flesh it out with primary documents, excerpts from oral histories, music, images and anything else that would be illuminating. Before and after shots would be particularly effective in telling the story of the events. The finished products could find a home on the UB and CHE websites. This project would build on research you have already begun, could draw on the resources we have collected on the website, and would contribute greatly to UB's effort to make this time period understandable to the public. I hope you will consider it. The MLL Department worked for the first time using Digital Stories with Spanish 305 for Heritage Spanish Speakers during fall 2008. This course is an advanced Spanish course for Latino students at UMBC (3-credit course) taught by Dr. Ana María Schwartz and Adriana Val as Tech Assistant. The goal of this class is to connect the students with their Spanish heritage language and culture, as well as to prepare them to be competent bilinguals who can use Spanish for academic and professional purposes. Students participated in face-to-face as well as online projects to improve their oral, writing as well as technical uses of the Spanish language. One of the projects designed by Dr. Schwartz was the use of Digital Stories. Students worked during the semester choosing their own topics, writing narratives, collecting photographs, and finding appropriate music to accompany their verbal narration. All students participated in peer-review in class, reflected with instructors and classmates about their narratives, and worked in the computer lab under the assistance of Ms. Val, personnel from the IMC such as Ms. Joan Costello, and video experts from the New Media Studio at UMBC. The product of this powerful work is the collection of the first digital stories from the first Heritage Spanish speakers who work intensively to share their personal stories. Cristina Dalton: ¿Qué soy yo? Who doesn't like a good show and tell? Now, this favorite grade school assignment is finding its way into more UMBC classrooms as digital stories: short (3-5 minute) digital movies based on personal photos, artifacts and a vivid memory of the students who produce them. In addition to assigning digital stories to develop or harness student media skills, many faculty are finding visual assignments deepen textual literacy, too. Starting with a 300-word focused narrative that students share in a story circle, Nicole King, Assistant Professor of American Studies, and a digital storytelling peer faculty trainer, shares how and why she offers visual assignments, how she evaluates them, and what she and her students are learning from the process. In the Fall of 2009, Susanne Sutton, lecturer of German with the Modern Languages, Linguistics and Intercultural Communication Department (MLLI) taught an Advanced German 303 topics course, "German Immigration into the US". As semester project, students worked on their own digital stories (in German) in which they recounted an experience they had had while having worked, studied, or vacationed abroad. Students then teamed up with first-generation German immigrant women from the larger Baltimore area. Students and immigrants collaborated to produce the immigrants' personal digital stories during a two day workshop. At the end of the semester, after the students had finished the immigrants' stories, everyone came back for a 'story festival' to view the finished products. In this core course for the MA program for Intercultural Communication in the Fall 2009 semester, the students worked with undergraduate students in Visual Arts 395 to develop stories about an intercultural incident or encounter that was a crucial factor in motivating them to study intercultural communication. Accompanying a final paper, in which this incident was the framework for an analysis of intercultural competency, sensitivity, and awareness, the stories tell of very personal encounters of US students either in the US or abroad, or international students in the US. They relate some of the painful and embarrassing, but also enjoyable and stimulating difficulties they have had adjusting and adapting to cultures that were other than their own. During January break the New Media Studio held its fifth annual digital storytelling workshop for UMBC faculty. Participants learned the technology and methodology of digital moviemaking, creating their own personal narratives while exploring applications in teaching and learning. Ten UMBC faculty members were joined by Archana Bhandari, Director of Instructional Technology at UMB School of Social Work for the three-day course. Workshop alumn Jason Loviglio, Director of the Media and Communication Studies program assisted in facilitating the writing component of the workshop. Other facilitators included Paul Iwancio, Bill Shewbridge and studio research assistants Satarupa Joardar, Chris Ferrera and Steve Yeager. New Media Studio and CHE Collaborate on "Hampton: A Revolutionary Place"
UMBC's Center for History Education (CHE) and New Media Studio have collaborated with teachers from Baltimore County Public Schools to create a new online resource for Hampton National Historic Site. "Hampton: A Revolutionary Place" was created as part of CHE's Making American History Master Teachers in Baltimore County Program, funded with a grant to Baltimore County Public Schools from the United States Department of Education. The Hampton project is one of several "virtual fieldtrips" to come out of last summer's workshop in digital storytelling and oral history. During the program, the New Media Studio worked with BCPS teachers to create rich media resources combining digital storytelling, photography, videography and web design. The National Park Service is featuring the project on the Hampton website. prompts to choose from for their final digital story projects. Tatiana Rais has shared with us two blogs created during a recent workshop. The first is an explanation (in english) of their daily schedule and the workshop process. They also created the second blog for the students. Part of the workshop was to give the students access to the internet and to self-publication. Here, the kids introduced themselves and wrote about their experience. The site includes all of their written stories with some pictures and a few of the final videos. While this website is entirely in spanish, all of the videos themselves have been subtitled. MCS101L, Multimedia Literacy Lab, is a one-credit course offered in two sections. The class is taken in conjunction with MCS333 . Students were given 6 story prompts to choose from for their final digital story projects. This spring students from MLL 495/695 Intercultural Video Production returned to the Arbutus Library to create another collection of digital stories from the community. This year's project focused largely on the librarians themselves. You can read about the project in the Arbutus Patch. You may also view the stories from this and last year's workshop here. During the spring 2011 semester, students in MLL 495/695 Intercultural Video productions completed two community-base digital story projects. The first brought the class to the Arbutus branch of the Baltimore County Public Library to help tell the stories of the librarians and others in the community. This was the second year for the project. Next the class went to the Charlestown retirement community for aa new round of Charlestown stories. This was a continuation of an award-winning project that began in 2006. The semester culminated in a showing of all stories hosted by the Arbutus Library. This spring students examined the history of American Youth Activism from 1945-1975 while producing digital stories and documentaries. Young Americans were important participants in the social, economic, and political changes that took place across society during the most intense years of the Cold War. The class emphasized skills in writing, oral history, and traditional research as well as digital storytelling computer technologies. Student first produced digital stories exploring the roots of their own political awareness. HIST 495 - 710 was held in the spring of 2011. The course was taught by Dr. Kriste Lindenmeyer, Chair of the UMBC History Department and Dr. Bill Shewbridge, Director of the New Media Studio. You can view the projects here. MCS101L, Multimedia Literacy Lab, is a one-credit course offered in two sections. The class is taken in conjunction with MCS333. Students were given 6 story prompts to choose from for their final digital story projects. As part of her Independent Studies in the New Media Studio, Fulbright Scholar Meri Collazos Sola developed a multimedia project using digital digital storytelling to explore identity and culture shock. The project website, www.cultureshockstory.com is based on Meri's research in the Intercultural Communications program. "This project contains the materials I will focus on for my scholarly paper. The scholarly paper should be related to some of the topics that we've done for the core courses. The main topics of the research will be intercultural competency, creativity and two up and coming new media formats: digital storytelling and personal documentary film." Prof. Nicoleta Bazagan has posted stories from her Spring 2011 French Cinema class here: http://www.youtube.com/user/nbazg . The stories are primarily in French however some students also produced english versions for extra-credit. 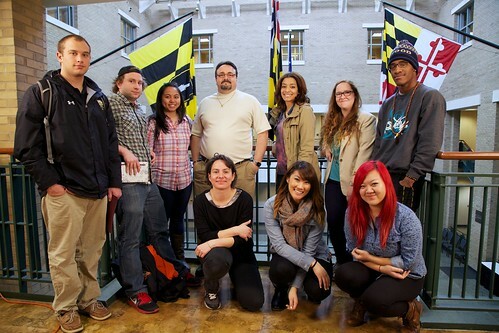 In January, 2012, the New Media Studio offered its sixth annual digital storytelling workshop. As in past years, the workshop gave faculty members an opportunity to explore digital media production while creating a personal narrative, integrating voice-over with images and sound. This year for the first time the workshop was offered as a one-credit course as part of UMBC's winter session. As a result graduate and undergraduate students joined the group, giving the workshop a new dimension. Here are some examples of the stories produced. Multimedia Literacy Lab in "Urbanite"
The New Media Studio's digital story work and the MCS 101 Multimedia Literacy Lab were featured in the April edition of "Urbanite" magazine. You can read "The Wired Campus" article online here. UMBC Digital Stories in EDUCAUSE "Game Changers"
UMBC's digital story work is highlighted in a new publication from EDUCAUSE. 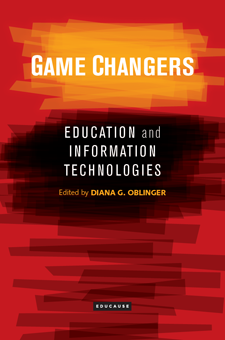 Game Changers: Education and Information Technologies contains case studies highlighting creative solutions to higher education challenges in difficult times. The chapter Stories in Our Classrooms: A Faculty Community of Practice as an Agent of Change by Beverly Bickel, William Shewbridge, and Jack Suess, describes the development of story work at UMBC and its importance in promoting digital literacies on campus. Editied by Diana Oblinger, the book and individual chapters are avaiable for free download. 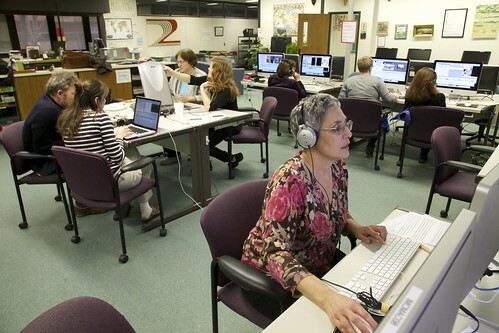 Once again, in January, 2013, the New Media Studio offered its annual digital storytelling workshop for faculty. As in past years, the workshop gave participants an opportunity to explore digital media production while creating a personal narrative, integrating voice-over with images and sound. Here are two updates from the Center for Digital Storytelling of interest to the UMBC community. First, there is an upcoming Webinar series, Seven Stages: Story and the Human Experience. Details are available here. Also, the fourth edition of Joe Lambert's Digital Storytelling: Capturing Lives, Creating Community is now available . You will find our work at UMBC highlighted in a new chapter on digital storytelling in higher education. Mill Stories is a collaborative project bringing together UMBC students to help preserve stories from the Sparrows Point community. As the project develops, we hope that this website will present a form of database documentary, in which users can access interviews, videos photos and other cultural materials gathered from the community. Two classes participated during the Spring 2013 semester. Students in AMST 358 Cultural Documentation in Partnership with Communities were introduced to the ideas, techniques and ethical considerations that underpin qualitative research, particularly from a community-based, out-in-the-field perspective. The course focuses on cultural research and documentation within the communities that have been shaped for over a century by the Sparrows Point Steel Mill. Students have also been introduced to broader notions of community cohesion, senses of place and belonging, as well as the realities of post-industrial economic and social transition. Students in MLL 495/695 Intercultural Video Production focused on creating short digital stories based on community interviews. The class takes a collaborative approach, allowing participants to tell their stories in their own words. Read about the project in the Baltimore Sun and the Dundalk Eagle. From July 2-11, 2013, 12 young people from Brazil attended a leadership camp through The Shriver Center at UMBC. The students are all participants in the English Access Microscholarship Program, which provides English-Language skills to talented young people from economically disadvantaged areas. During their time at UMBC, the students participated in service-learning projects, spent a weekend with American families, toured Baltimore and DC, and created digital stories. Students in the Shriver Center's Peaceworker Program's Summer Pro Seminar created these stories reflecting on their service and experiences abroad. Here is a great article by Polina Vinogradova, based largely on digital story work at UMBC. Digital stories in a language classroom: Engaging students through meaningful multimodal projects http://fltmag.com/digital-stories, Ana Oskoz and Heather Linville also contributed to the article.